On this page there is information about Iris species that cannot be included on our other wiki pages. One group represented is Subgenus Nepalensis. In Brian Mathew's The Iris the descriptive feature of this Subgenus is the rootstock. This consists of a small growing point to which the plant dies back completely in winter like many herbaceous plants, and attached to this are some storage roots which are either swollen up to the point of attachment, or thin to begin with and then swollen towards the ends. At the apex of the growing point is a tuft of fibrous leaf bases left over from previous years. The leaf veining is very prominent in the fresh state. The flowers are very short lived, each lasting less than one day. 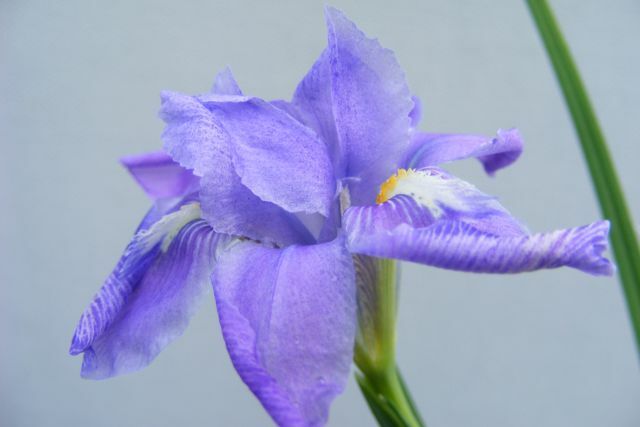 Iris decora is a species in Subgenus Nepalensis and native of the Himalayas over a wide area from Kashmir in the west through Nepal, Sikkim and Bhutan. To the north it reaches into southern Tibet and to the south into the north Indian mountains of Simla, Gaswhal, Khasia and Shillong. It is a plant of open sunny hills and pastures, mountain scrub, rock crevices and clearings. It flowers May to July at altitudes of 1000-4400 meters. My plant was grown from seed kindly sent to me by a friend in New Zealand and was sown in May 2007 and flowered for the first time in June 2009. My maritime climate, here in Devon, UK is such that I doubt it will be possible to grow the plants other than under glass. Photo by David Nicholson.